This article was originally published on January 3, 2019 and expired on February 23, 2019. It is provided here for archival purposes and may contain dated information. 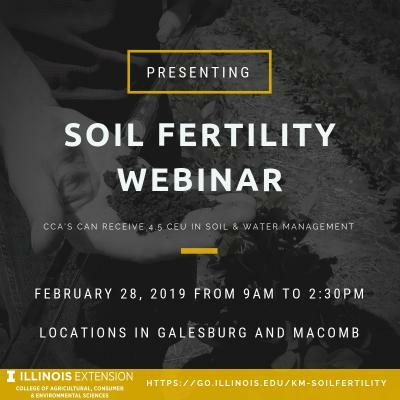 Commercial Agriculture Educators Jesse Soule, Phillip Alberti, and Talon Becker will be hosting the annual Soil Fertility Webinar sponsored by University of Illinois Extension on February 28, 2019. This webinar will be hosted in the U of I Extension Offices in Knox and McDonough Counties. Presentations will be delivered via PowerPoint and web conferencing from 9 a.m. to 2:30 p.m. and lunch will be provided. "Those in attendance will hear about the latest University of Illinois research on the long-term effects of crop rotation and tillage, as well as the relationship between cover crops and soil nitrogen availability. Other presenters from the University of Wisconsin, Western Illinois University, and the Illinois SWCD will discuss nutrient loss on tile-drained land, nutrient management in organic systems, and a farmer-led program to improve soil health," says Jesse Soule, U of I Extension educator. Certified Crop Advisors looking to earn continuing education units may register at https://go.illinois.edu/KMsoilfertility .